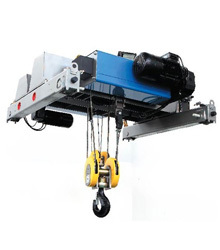 Electric wire rope hoist is a small lifting equipment, with the advantages of compact, light weight, small size, parts versatility, easy operation. 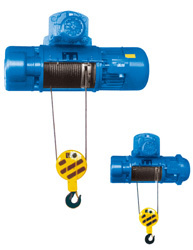 Liftking brand electric wire rope hoist consist of reducer,control box,wire rope,motor and the button switch. The reducer use of three fixed-axis helical gear drive mechanism,gear and the gear shafts are made by heat treated alloy steel;shell and the cover are made by high quality cast iron, closed and well sealed. The control box consist of a limited device, which can cut off the main circuit immediately in the emergency. Durability steel wire rope. The lifting motor use the large torque conical rotor to start the asynchronous motor without the external starter. Handle style button switch, light weight and flexible, sub-corded and cordless remote control in two ways! Liftking brand electric wire rope hoist lifting weight is from 0.25ton to 20ton, the lifting height is from 3 metres to 120 metres. There are two types: CD1(single speed) and MD1（dual speed). It can be installed on the I-beam and also be fitted with the electric or manual single beam,dual beam,cantilever, gantry cranes and other cranes. 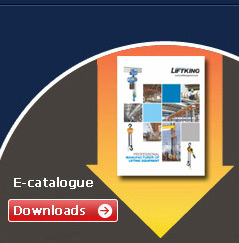 Liftking brand Electric hoist are widely use in factories,warehouses, logistics, port and other industries. Rope hoists are composed of a large wire rope connected to a hook. Wire rope hoists are used to carry large objects weighting between 1 ton and 120 tons, and are also used to lift heavy objects in severe heat while welding. 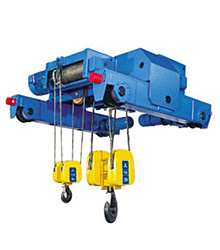 As the name states, a wire rope hoist uses a wire rope, which is a rope made out of wire fiber. Rigging and installing a wire rope hoist requires you to make a number of choices. Choices about the size of the blocks through which you'll rig the wire rope, choices about rigging the hoist to advantage or to disadvantage, and a choice about where to attach the hoist, whether you attach it to a single strong point, like a rafter in your roof, or a movable point, like the end of the boom of a crane. With the right choices, everybody wins.